Transport & Logistics sector plays a pivotal role in ensuring the delivery of goods from the place of production to the consumption point. The sectoral challenges include need for constant improvement in the overall efficiency in terms of handling, loading, transporting and unloading of goods throughout. The faster operations and smoother exchange of goods is the one more foremost requirement of an efficient transportation system. The transport and logistics (T&L) sector in India is evolving rapidly considering the increased level of economic activity across the length and breadth of the country. The efficiency of the sector largely depends on the infrastructure available, technology used and the transportation system. Sandeep Sharma takes a look at the challenges and opportunities before the transport and logistics sector in India. India's transport system is one of the largest in the world. The sector mainly comprises of railways, roads and air services. The use of water transport is being encouraged by the current government. The transport and logistics sector in India is highly fragmented. The need of the hour is to transform the transport sector through building robust infrastructure, uniform regulations across the country, improved customer service/data analysis and better use of IT systems. The Government of India is taking steps towards Integrated multi modal transport planning and execution. This is likely to help the country to achieve a healthy modal mix of transport, which is efficient, faster, safer, import substituting, cost effective and pollution free. The increased number of transactions happening online has added more pressure and provided opportunities for players in the T&L sector to grow. As the country moves towards building a manufacturing hub the demand for efficient T&L is the need of the hour. McKinsey Global Institute (MGI) study suggests that if India continues to grow at the current pace, the average household income is likely to triple over the next two decades. The study predicts India becoming the world’s fifth-largest consumer economy by 2025, up from the current 12th position in 2017.According to a report by the Boston Consulting Group, the Consumption expenditure in India is predicted to increase three times to hit $4 trillion by 2025. The increase in economic activity and improvement in the purchasing power of the individuals and families are likely to spurt retail sector growth in times to come. This calls for strengthening the transport and logistics segment in India by encouraging private sector player to enter this segment on a larger scale, build the transport infrastructure and educate the players towards using technology to improve the overall efficiency and deliverability. Global companies see India as an emerging market for massive consumption of goods and services. Nitin Gadkari, Minister of Road Transport & Highways while addressing India Integrated Transport and Logistics Summit in the previous year has said that high logistic cost is one of the major impediments to India's economic growth. He has urged all the stakeholders to make attempt to reduce logistic cost and make it globally comparable. The challenges before the T&L sector includes the following: 1) The country lacks integration of transport networks, information technology, warehousing, cold chains & distribution facilities. 2) Trained manpower is not enough and efficient across the entire supply chain which leads to delay in delivery and damage of goods during transit, 3) Deficiency of modern transportation carriers and material handling equipment. 4) Insufficient public transport system like Metro Rail, Suburban trains, buses, etc leading to more number of private vehicles on the road, ultimately affecting the environment. 5) Too much of stress on roads and railways in certain geographies. 6) Lack of Rail and Road network coordination and integration. 7) Not making use of the vast coastline for transportation of men and material. To sort out the transport and logistics sector bottleneck and use an integrated approach and model to transport men and material across the country. The Government of India has taken number of initiatives and launched several programme. The focus of the government has not shifted to multi-modal transport planning with special emphasis in creating a synergy in investments across railways, roads, waterways and civil aviation sector. The engineering marvels like the Dhola Sadiya bridge in Assam and Chenani Nashri tunnel in Jammu and Kashmir were opened up in year 2017 which has connected far-off areas and paved the way for socio-economic development. Bharatmala Pariyojana launched in 2017, is touted as India’s largest ever highways development programme. The programme promises to optimize the efficiency of road traffic movement by bridging critical infrastructure gaps. Multi-modal integration is one of the key focuses of this programme. Around 53,000 km of NHs have been identified to improve National Corridor efficiency, of which 24,800 km are to be taken up in Phase-I, which will be implemented between 2017-18 to 2021-22. This includes 5,000 km of the National Corridors, 9000 km of Economic Corridors, 6000 km of Feeder Corridors and inter-corridors, 2000 km of Border Roads, 2,000 km of Coastal Roads and Port Connectivity Roads and 800 km of Greenfield Expressways. Total likely fund provision for Bharatmala Phase-I is Rs. 5,35,000 cr. Bharatmala is expected to be a major driver for economic growth across the country. The other initiatives of the Roads Ministry include sanctioning of 20 Inspection and certification Centres for testing the fitness of the commercial vehicles though an automated system. Six centres are already operational. These centres will provide for objective evaluation of road worthiness of the heavy commercial vehicles. Electronic toll collection (ETC) system, the flagship initiative of MoRT&H, has been implemented on pan-India basis in order to remove bottlenecks and ensure seamless movement of traffic and collection of user fee as per the notified rates, using passive Radio Frequency Identification (RFID) technology. Indian Highways Management Company Limited (IHMCL), a Company registered under the Companies Act, has been incorporated for working as implementing agency for ETC with National Payment Corporation of India (NPCI) functioning as the Central Clearing House (CCH). 11 banks (including Public and Private sector banks) have been engaged as issuer Banks in order to issue FASTag to road users. The Roads Ministry has envisaged a plan for replacement of Level Crossings on National Highways by ROBs/ RUBs under a scheme known as Setu Bharatam. Under this programme, construction of 208 RoBs/ RuBs on Level Crossings (which are not falling under any other programme like NHDP etc.) at an estimated cost of Rs. 20,800 crore is envisaged. Out of these 208 ROBs, Detailed Project Reports for 127 ROBs have been received in the Ministry, out of which 78 ROBs with an estimated cost of Rs. 6428.57 crore have been sanctioned till 31.03.2017, of which 35 works have been awarded so far. 09 ROBs with an estimated cost of Rs. 576.58 crore have been sanctioned till date during FY 2017-18. The Roads Ministry has taken up a new initiative, known as Indian Bridge Management System (IBMS), to inventorize all structures e.g. Bridges and culverts constructed on the National highways. The consultants have completed their report and also undertaken the condition assessment of all the existing bridges on National Highways. As such, inventory for more than 1,62,000 bridges and culverts has been completed. A total of 147 Bridges have been identified as distressed structures which call for immediate restoration/ replacements. A time-bound action plan to undertake repairs and restoration or construction of new bridges in place of the decadent structures has been put in place. The 473 km expressway will link Ahmedabad-Vadodara Expressway to Mumbai-Pune Expressway thus providing Expressway connectivity from Ahmedabad to Pune for a length of about 650 Km. The project will be taken up in three phases and estimated to cost Rs 27000 crore. Land acquisition, environment clearance etc are at advanced stage of approval for Phase I and II. Bids have also been invited for the First package of of phase -1. The Centre has given top priority to construction of Vadodara-Mumbai Expressway and the mega project will be awarded soon after completing bidding process. 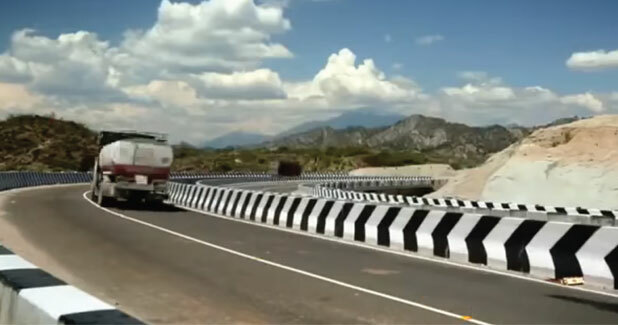 Bangalore-Chennai Expressway covering 262-km is a greenfield alignment and will be operated with a closed toll system. There are two existing roads connecting Bangalore-Chennai, one is via Hoskote (Bangalore)-AP then to Chennai & second is via Electronic City (Bangalore) Hosur (Tamil Nadu) and then to Chennai. The alignment of proposed expressway is passing between these two stretches. The processes of land acquisition, environment and other pre-construction activities are under progress. A new four lane, Extra-dosed Bridge with 1.4-km length has come up across river Narmada at Bharuch benefiting people travelling on the Vadodara-Surat section of NH-8. The projects envisages development of easy access to the four prominent pilgrimage sites called as Char Dhams, namely, Gangotri, Yamunotri, Kedarnath and Badrinath, situated in the state of Uttarakhand. The project entails development of 889 km of roads with configuration of two-lane with paved shoulders at an estimated cost of about Rs.12,000 crore. So far, 24 works have been sanctioned traversing a length of 395 km. 22 works covering a length of 340 kilometre have been awarded. The projects are being taken up on EPC mode amd the program is targeted for completion by March, 2020. The project of Peripheral Expressways around Delhi, comprising Eastern Peripheral Expressway (EPE) and Western Peripheral Expressway (WPE) emanating from NH-1 (near Kundli) and terminating at NH-2 (near Palwal), bypassing Delhi aims to decongest Delhi and reduce pollution levels in the NCR. Eastern Peripheral Expressway project was inaugurated on May 27. As of November 2017, Pachgaon to Palwal section is operational since April 2016, and the rest is 85% complete and likely to become completely operational by end of July 2018. The Delhi-Meerut Expressway (DME) aims to provide a fast link between the two cities. The alignment of DME starts from Nizamuddin Bridge from Delhi and follows existing NH 24 up to Dasna. While one leg of DME will continue from Dasna on NH 24 to Hapur, a Greenfield alignment has been planned from Dasna to Meerut. The 8.7 km, 14-lane highway is being completed in a record time of about 15 months as against the original scheduled completion period of 30 months. This first stretch from Nizamuddin Bridge to UP Border is provisioned with 14 lanes, and has several features that would help reduce pollution. These include a 2.5 metre wide cycle track on either side of the highway, a vertical garden on the Yamuna Bridge, solar lighting system and watering of plants through drip irrigation only. The Ministry of Roads and Highways has taken up construction of a signature four-lane bridge to connect the mainland at Okha to Byet-Dwarka Island off the Gujarat Coast with this signature Bridge spanning a length of 2.32 km. The project has been awarded in Jan 2018 at a cost of Rs 689.47 crore. This will be the longest span cable stayed bridge in India with the main span of 500 metre. The completion is targeted in 30 months time. The 9.15 km long Dhola-Sadiya Bridge has come up over River Brahmaputra in Assam thereby providing 24×7 connectivity between upper Assam and Eastern part of Arunachal Pradesh. The distance between Rupai on NH- 37 in Assam to Meka/Roing on NH-52 in Arunachal Pradesh has been cut down by 165 KM. The travel time between the two places has come down from six hours to just one hour – a total five hour reduction. The transport sectors like railways, aviation, roads and shipping are already seeing lot of growth and development due to increase in economic activity and infrastructure building activity across the country. The promising projects under implementation include the Eastern Dedicated Rail Freight Corridor covering 1,856 km and Western Corridor traversing 1,504 km. These projects are likely to increase freight carrying capacity of the railways and lead to the increase in the industrial development all along the corridor. The need of the hour is to build seamless transportation network across the country comprising physical infrastructure, multimodal logistics parks (MMLPs), inland container depots (ICDs), container freight stations (CFSs)/ private freight terminals (PFTs), ports, and airports. The warehousing / storage infrastructure needs to be spruced up. Tonnes of fruits and vegetables in India get wasted due to lack of proper storage. All the stakeholders need to come together and ensure proper planning goes into building warehouses/cold chains at the right locations and robust logistic infrastructure is made available. The transportation of coal, iron ore, cement and other vital raw materials from the place of mining / production to the consumption point is critical to the development of various sectors of the economy. For seamless movement of people, the integration of the various modes of transport including railways, roads, metro rail, buses are quite critical and provide billion dollar opportunities. The Logistics Sector has been granted Infrastructure status and integrated development of the sector is being planned. Infrastructure status will enable the Logistics Sector to avail infrastructure lending at easier terms with enhanced limits, access to larger amounts of funds as External Commercial Borrowings (ECB), access to longer tenor funds from insurance companies and pension funds and be eligible to borrow from India Infrastructure Financing Company Ltd (IIFCL). The logistics cost in India is very high compared to developed countries affecting the competitiveness of Indian goods both in domestic as well as export market. Development of logistics would give a boost to both domestic and external demand thereby encouraging manufacturing and generating employment opportunities. The focus on building roads, highways and rural infrastructure, maritime sector initiatives, development of inland waterways for passenger and freight transport, port sector modernisation and development, building and upgrading of airport infrastructure across the country and many more such initiatives are all pointing to windfall of business and profits for the transport and logistics sector players.